Thank you so much for your blog that has saved my daughter and I from living on salad leaves whilst in London. 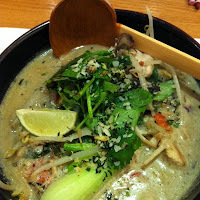 We found your blog and have enjoyed all your suggestions especially Wagammamas. The staff are extremely helpful and the food delicious with no side effects. Such a pleasure. Also the sandwiches from M & S at Westfields for taking into the Olympic park. Certainly no gluten free food within the Olympic park and exorbitant prices for a salad!! We have really appreciated all your helpful suggestions - it has made our stay in London enjoyable. The Natural History Museum has a restuarant that serves gluten free pasta and pizza. Very tasty and the staff understand what gluten free means. Lovely to have a place to eat when you are there for the day. 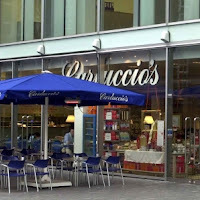 Last week eaten at Leon and Carluccio, very tasteful! Carluccio has a big menu, especially for GF, great mushroom soup and pasta. Unfortunately I was too satisfied to have a dessert. Very good service at all. 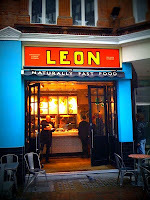 Leon has a new menu, nice steamed salmon and nice vegetables. Good ambiance. Influenced by personalized experience, Amanda Geary founded the Britian's Food in addition to Feelings Project in 1998.I began the meal in addition to Feelings Healthy Food Delivery London project using from my own.